Red Plenty Book Event – the eBook! Back around Christmas I had a come-to-Jesus moment, ebooks-wise. I posted some iPad optimized ebooks of Dickens and Spenser, trying to make the illustrations look good. I joked that PDF was the future! Then Santa gave me an iPhone for X-Mas and I discovered that I actually like reading books on a phone, which seemed a priori impossible before that. So, when I volunteered to make our Red Plenty PDF ebook – here it is – I also decided to try to make my first Mobi format ebook (5 megs) (that’s what you need for your Kindle); and an EPUB version (1 meg). No, I don’t know why the Kindle version is so much bigger, thanks for asking. Both versions have some humorous bugs I’ve not yet worked out, and I gotta catch a plane. So I’m just going to post them and let other people kick the tires. WARNING: We have a reliable report that the EPUB version crashes Nooks. Very sorry about that. I really need to get back on this, and clean out the bugs. Haven’t had time. Two things as the seminar wraps up (Cosma Shalizi is writing a response to comments which I will link to, but which will be hosted on his own site, since CT plays badly with the math script that he uses). First, a pointer to blogger and sometime CT commenter Adam Kotsko’s review of Red Plenty at The New Inquiry. People should go read. Second, a thank you. Without disparaging individual contributions to other seminars, I think that this was the best seminar we’ve done here (obviously, this is my personal opinion; not at all necessarily endorsed by other bloggers here etc). Part of this is due to Francis – for writing the book (which couldn’t have been better aimed at CT’s sweet spot if it had been written for this purpose and this purpose alone), and for his lovely three-part response. Part of this is due to the many splendid contributors who wrote posts for the seminar. And part of it is thanks to the commenters – we’ve hosted many good conversations over the years, but this has been something rather special. I find it difficult to make it clear just how grateful I am to all of you who have participated in this. Seeing how it has worked out has made me very happy. I agree strongly with Rich Yeselson that praise for the novelty or innovativeness of the book’s form has been overplayed. The overall patterning of it is fiddly, but the pieces of which the pattern is made are as straightforward as I could make them, and not just because as I get older, I increasingly think that simple is more interesting (and difficult to achieve) than complicated. It’s also, as he says, that I had lots of very well-established precedents to draw on. On the historical novel side, the whole Tolstoy-does-Napoleon recipe for dramatising the viewpoints of the grand historical figures, and the equally available rule of thumb that tells you how to mix the documented and the imagined to create the illusion of comprehensiveness. And, drawing on SF, I had the scientist-fictions of Ursula Le Guin and Kim Stanley Robinson to follow. My Kantorovich very clearly has the DNA of Le Guin’s Shevek and Robinson’s Sax Russell in him. Not to mention – as I’ve carefully confessed in the notes – that the whole alternation of character-driven scenes with italicised authorial narration is lifted straight out of Red Mars. And collections of linked short stories that fill in different vertebrae of a narrative spine are not exactly unheard-of, either, from Kipling to Alice Munro. I am proud of the two ‘machine’ sections, set in Lebedev’s logic and Lebedev’s lungs, one in which determinacy produces indeterminacy, the other in which the arrow goes the other way; and the messages of approval from George Scialabba’s amygdala cause fluttering in my own; but it’s not like Don DeLillo doesn’t already exist, and Pynchon, and for that matter Nicolson Baker. It’s not as though there isn’t a blazed trail for paying imaginative attention to system. I’m delighted that that Antoaneta Dimitrova finds my portrait of late-Soviet mediocrity in the Party authentic. It seemed to me to be one of the most immediate anti-ideal forces in the Soviet environment, working briskly from the get-go against all beautiful dreams, that the perverse incentives of the place on the human level had made it inevitable, after the revolutionary generations were gone, that it would be staffed at the top by those who were best at getting along in a tyranny, rather than by those who were most devoted to the tyranny’s aims. Hence the rise under Stalin of Brezhnev’s generation of vydvizhentsy, ‘promotees’, scrambling to seize the chance for upward mobility represented by the purges, and then that generation’s reproduction of itself in the 1960s and 70s, once it was setting the incentives, from among the greediest, most amiably shameless, most opportunistic of the young. For a novel about utopias, there’s something almost disconcertingly utopian about being read this way. All this generous attention; all this ideal intelligence. Thank you, everybody. There’s even a Soviet rationalisation available to me to ease the moral strain of being in receipt of this pocket-sized, individual portion of critical happiness. Like the inhabitants of Akademgorodok, the privileged science city in Siberia which plays such a large part in Red Plenty, I can choose to tell myself that being Crooked Timberized is only an early and individual manifestation of a good fortune that is shortly to become universal. One day, every book will be read like this. In the radiant future, every author will be ringed by symposiasts asking demanding yet perceptive questions. Every topic will have its conceptual underpinnings set into casually dazzling order by a Cosma Shalizi essay. And all the springs of co-operative wealth will flow abundantly. 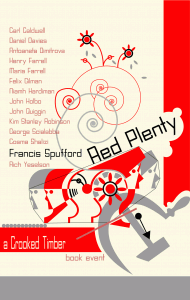 Among the many reasons I enjoyed Francis Spufford’s Red Plenty, one of the most important is that the story it tells is part of my own intellectual development, on one of the relatively few issues where my ideas have undergone an almost complete reversal over the years. I was once, like most of the characters in the book, a believer in central planning. I saw the mixed economy and social democracy as half-hearted compromises between capitalism and socialism, with history inevitably moving in the direction of the latter. While I was always hostile to the dictatorial policies of Marxist-Leninism, I thought, in the crisis years of the early 1970s, that the Soviet Union had the better economic model, and that the advent of powerful computers and new mathematical techniques would help to fix any remaining problems. At the same time, I was critical of the kinds of old-style methods of government intervention (tariffs, subsidies and so on) that are now called ‘business welfare’. Over time, and with experience of actual attempts at planning on a smaller scale, I became steadily more disillusioned with the idea. On the whole, I concluded Hayek and Mises had the better of the famous socialist calculation debate of the 1920s and 1930s, and that their arguments about the price mechanism had a lot of merit. This didn’t, however, lead me to share their free-market views, particularly in the dogmatic form in which I encountered them studying economics at the Australian National University. Although I hadn’t read him at the time (and I wonder what Corey Robin would have to say on the subject), I agree pretty much with Oakeshott when he says ‘This is, perhaps, the main significance of Hayek’s Road to Serfdom — not the cogency of his doctrine, but the fact that it is a doctrine. A plan to resist all planning may be better than its opposite, but it belongs to the same style of politics’. This aspect of Hayek is even more pronounced in Mises, for whom free-market economics is a matter of logical deduction, and taken to a ludicrous extreme by their propertarian followers today. The same kind of thinking was evident in much of the financial ‘rocket science’ that gave us the global financial crisis. The belief was that sufficiently sophisticated financial ‘engineering’ could overcome the realities of risk and uncertainty, producing untold wealth for its practitioners while making society as a whole more prosperous – only the first part of the promise was delivered. So, rather than switching from central planning to free-market capitalism, I’m now, in Andre Metin’s description of Australia in early C20, a believer in ‘socialism without doctrines’, starting from the historical premise that Keynesian social democracy has delivered better outcomes than either free-market dogmatism or central planning, and looking for ways to develop a new social democratic vision relevant to our current circumstances. As Red Plenty shows, my enthusiasm for and disillusionment with central planning was about fifteen years behind the same developments in the Soviet Union itself. Spufford gives us a sympathetic picture of their hopes, and of the promise generated by new mathematical techniques like linear programming and optimal control (although entirely free of actual math, the book does a better job than any I’ve read of conveying the feel of these techniques). In 1956, Kruschev makes his famous promise of overtaking the US, and it seems quite credible, but a decade later, all belief in the promise of plenty has been lost. As the book ends, the mathematical programmers charged with making the plan work are pushing the benefits of prices – some at least, like Janos Kornai, would complete the journey to the free-market right, and advocacy of the ‘shock therapy’ approach to post-Communist transition. Red Plenty is a great book. It would be fascinating to see Spufford tackle the post-Soviet transition and particularly the way in which liberal reformers like Chubais and Berezovsky transformed themselves into oligarchs, with the aid of Western academic economists like Andrei Shleifer. The pattern of naïve faith and disillusionment with free-market economics would make a perfect counterpoint to the story of central planning presented here. Not long before I read Francis Spufford’s Red Plenty, I happened to read Life and Fate by Vasily Grossman (prompted by BBC Radio 4’s excellent 13-part dramatization), so I was very struck by the parallels in scale and approach between the two works. Both are conceived on a vast scale; both draw the reader into the lives of a large number of characters at all strata of society. In both books, real historical people mingle with fictional characters. The long shadow of Tolstoy is apparent in both. Grossman had a real advantage over Spufford in that he’d lived through the siege of Stalingrad which features so centrally in his novel, and he’d had exceptional freedom as a war reporter to talk to people from many different backgrounds. Of course Tolstoy had to recreate Napoleon’s invasion of Russia from research and imagination, but he too was immersed in his own society and culture, and was able to avail of first-hand encounters with veterans of the campaign. Spufford has had to re-imagine the world of Khrushchev’s Soviet Union much more thoroughly, through extensive engagement with scholarly literature, memoirs and other sources, in this vivid and beautifully written book. But it’s the contrasts between Grossman’s and Spufford’s books that are perhaps more striking. Back in the days before I had realised that a guy who takes five years to deliver a simple book review probably ought to rein in the ambition a bit when it comes to larger-scale projects, I occasionally pitched an idea to publishers of management books. It was going to be called “Great Ideas From Failed Companies”, the idea being that when you have the perspective of the entire history of a corporate story, you’re probably going to get a more honest appraisal of its strengths and weaknesses, and that although companies like Enron, Northern Rock and Atari clearly had major problems, they quite likely also had some good points too, or how did they ever get so big in the first place? Apparently some readers have been confused about Red Plenty, thinking it is non-fiction. I had the opposite problem, or possibly it wasn’t one. I knew it was fiction but I had the wrong idea about what kind. This error persisted, uncorrected. I actively avoided all reviews or summaries. I solicited no assistance, along the way, from “the panther-footed Mr. Google,” as he is described in Spufford’s “Acknowledgement” section. As a result, I didn’t know what the hell was going on – at all – until the end. Because the one thing I thought I knew about the book – no, I don’t know where I mis-acquired this notion – was that it is a fictional alternative history of how Red Plenty, the fairytale dream, came true. Francis Spufford’s sprawling mosaic of the Soviet Union in the 1960s at first reminds one of Vasily Grossman’s account of Stalinism and the Second World War in Life and Fate. Both use a variety of characters—workers and soldiers, technical elite and normal party cadre—to shift places and perspectives, in order to reveal the hopes, contradictions, and failures of the periods they describe. Both are eminently historical novels, based on extensive scholarly reading in Spufford’s case and vast journalistic experience in Grossman’s. But there the similarity ends; each novel has a quite different point. Life and Fate is horribly tragic. The Red Army soldiers in Stalingrad are marked for death by the Germans and by “resolute” party cadre behind the lines at the same time. Juxtaposed to the horrific image of the woman hugging the child in the gas chamber is the postwar anti-Semitism that seeps through the pores of late Stalinism. 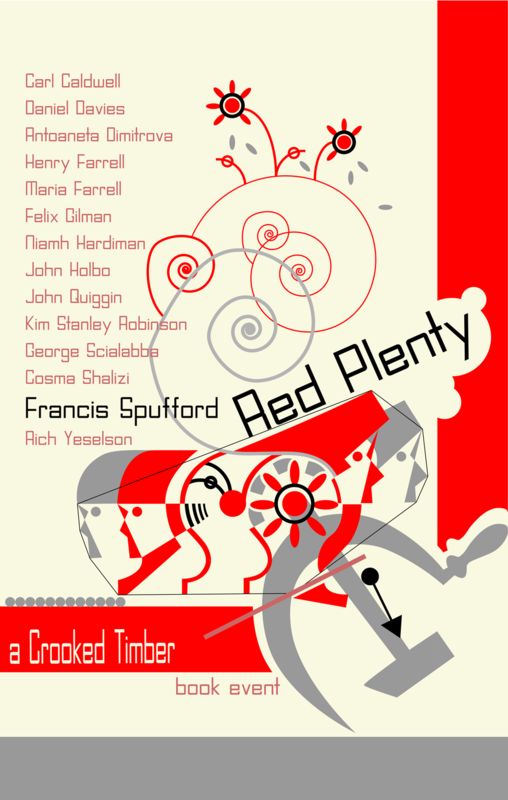 Red Plenty, by contrast, despite the wretched fates of some of its characters, reads like a comedy, at times a dark one. The hopes of the mathematicians and cyberneticians prove mere wishful thinking within the real system of state socialism—the actual subject of the novel. In the first chapter, the prodigy Leonid Kantorovich thinks his deep thoughts on how to optimize the Soviet system—”All he would have to do was to persuade the appropriate authorities to listen”—while tuning out the reality of the bus. “He could tune up the whole Soviet orchestra, if they’d let him. His left foot dripped. He really must find a way to get new shoes.” Idea confronts reality; were this filmed, it could be slapstick.